Until 2010 the eventing community had never heard of Marilyn Little of Raylyn Farm, as the Frederick native was in the middle of a very successful international show jumping career. But this summer, just five years after her first event, Marilyn’s name echoes across the eventing world both here in the U.S. and abroad as the 33-year-old just won two gold medals at the 2015 Pan American Games in Toronto, Canada. In September of 2010, Marilyn was watching the FEI World Championships of Eventing on television and decided she wanted to try her hand at the sport. That October, Marilyn and the show jumper Udonna entered the October Maryland Horse Trials at Loch Moy Farm in Adamstown. She was hooked and set her sights next on the 2011 Fair Hill International–a lofty goal, as Marilyn would have to qualify through a series of stepping-stones from Training level through Advanced in just one year. Although many thought this was an impossible goal to achieve, Marilyn’s determination and extensive skills as a high performance competitor proved them wrong as she finished ninth in the CCI3* division at Fair Hill riding RF Rovano Rex, making them the highest placing Maryland pair that year. The next year, Marilyn and RF Demeter placed ninth at the 2012 Rolex Kentucky CCI4* event. Since then, Marilyn has finished in the top 10 at two four-stars, 14 three-stars, and 17 two-stars with nine different horses. In 2012, she finished second and fourth at the Fair Hill International CCI3* with RF Smoke on the Water and RF Demeter, respectively. In 2013 she placed seventh at Luhmuhlen CCI4* with RF Demeter. And in 2014, she finished fifth and sixth at the Rolex Kentucky CCI4* with RF Smoke on the Water and RF Demeter, respectively. And then came RF Scandalous, a 2005 16.2 hand Oldenburg mare owned by Phoebe and Michael Manders. This year alone, the pair won four CIC2* events and one CCI2* event before heading to Toronto as part of the U.S. Eventing Pan American team. 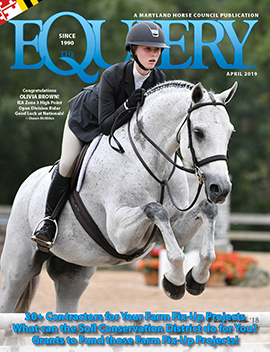 “It takes a lot of horses to stay at the top of this sport,” Marilyn said in a recent interview with The Equiery. “I am very grateful to all the owners involved with my horses.” And staying at the top is exactly where Marilyn plans to be. In this Q&A with the double gold medalist, we asked Marilyn about her road to the Pan American games, a bit more about her international partner RF Scandalous, and what is next for the pair. Q: Tell us a bit about your international career. A: I’ve had lots of abroad experience in places like England, Holland and Germany, though most of that has been in show jumping. I’ve been eventing abroad for the past four years. Q: Do you find there is a difference between competing as an individual and competing on a team? A: It is very unusual to compete as a team because this is such an individual sport. Plus you end up having your own team of grooms, vets, etc. that then need to work with those provided by the U.S. team. The first time I rode as a U.S. team member was when I was 18. [Marilyn was the youngest rider to ever represent the U.S. Equestrian Team on a Nations Cup Team Tour in Europe.] I think those years of experience helped me at the Pan American Games. Lauren [Kieffer] and I were newcomers to the U.S. Eventing team but not new to that group of riders or new to riding with [U.S. Eventing Team coach] David O’Connor. Being part of a team means being able to perform your best while being supportive of the rest of the team. I came out with closer relationships than when we started and I hope to keep those relationships going for years to come. Q: Tell us a bit about RF Scandalous and how you two became such a successful pair. A: Scandalous was new to my barn last year. I was looking at her for a client but fell in love with her. She was beyond my financial reach and on paper she was a huge risk. At the time she hadn’t completed an FEI event. Michael and Phoebe Manders stepped in to help make it happen. The goal was to do the CCI2* at Fair Hill last fall but we did not qualify so I took her to Galway in the one-star instead. [Marilyn and RF Scandalous won the 2014 CCI1* at Galway Downs in California.] She felt ready for a three-star around March  but we decided to go for a spot on the Pan Am team instead so I kept her at the two-star level to prove she was able to make the team. This was really a great thing to do as I know her so well now because of all of the two-star preps we did. Because I was competing her so much, I was not trying to make time [on cross-country] at those events. The question as we got closer to the Pan Ams was could she make the time. At Ocala she got it done very easily! She is a very rideable and smart horse and at 10 years old, her maturity level is very good. I think this gives her a huge advantage even if she has not competed at the three-star level yet. Q: What were the steps or events you had to complete in order to be considered for the Pan American team? A: Last fall it was Fair Hill, but we did not qualify and went to Galway instead. This year it was Jersey Fresh and Ocala. We did Ocala. Most horses who were being considered had gone to most of those events but even though we had only done one of them, we were still being watched by the selection committee this spring. Q: What were your thoughts when the team was announced? A: I was thrilled! But since the announcement was made in May, the challenge was keeping the excitement to a manageable level since we had so much time to think about the games. It was David’s decision to select the team early, which I think really helped to make us a better bonded team. Q: What were the final steps you took leading up to the Pan American Games? A: We had a final training camp in Middleburg, Virginia the week before the games. No spectators were allowed at this camp and it was a great experience. Really helped us to focus and get ready for the games. We then shipped the horses up to Toronto early in the week right before the games started. Q: Talk us through each day of the Pan American Games and how you felt each phase went. A: For dressage, Scandalous took to the atmosphere really well. It was not our best test, however, as she had done the two-star test so many times that she was anticipating the movements. We had to become a bit creative in how we warmed her up! The cross-country was held off-site about 30 minutes away, which became a challenge because of all of the people, horses and equipment that needed to be shipped to the facility and the super-high security of the Games. It was kind of a logistical nightmare but worked out very well. The whole U.S. team did a great job so that we as riders only had to worry about our ride. For us, the course rode as planned. I was a little worried about the time but knew she could make it. The pressure was really on! I had a whole lot of horse coming out of the start box and was ahead of time at the two-minute mark. After that, I just needed to make sure there was enough horse left to finish and so it became a test of how to manage her around the course. Fitness was an issue for some of the other teams. The crowds were great and there was a lot of cheering! It was unfortunate that no TV coverage was allowed even in Canada and that owners and fans could not be a part of the experience. Q: Was there an extra show jumping round to determine individual standings? A: No, actually, and we all thought we were going to have to jump two rounds. The change was made during the competition, probably due to the fitness level of some of the horses. Most everyone was happy with the change. Q: What was your best memory from the Pan American Games? A: There is no feeling like standing on that podium with your teammates and hearing your national anthem being played. I’ve grown up dreaming about that moment. You want to pinch yourself and can’t believe it is actually happening. But then you think about all the people and time it took to make it there and you believe it. It is a very long road. Q: What is next for you and RF Scandalous? A: Poplar [Place Farm, GA] will be her first three-star. After that, it is really up in the air. We will be doing Plantation Field [PA] and then I am hoping to take her to Boekelo in Europe or to Fair Hill’s three-star. Q: With all of your international experiences and connections, why continue to live and train in Maryland? A: My heart is in Maryland. I was born here. My family is here. My owners are here. Maryland is a wonderful place to raise and train horses. The more and more I’ve traveled and seen what is out there, the more I want to come back here. Phoebe and Michael Manders of Potomac have known the Little family and Raylyn Farm for years, having crossed paths numerous times in Potomac and in the show hunter and jumper world. They were reaquainted in 2011 when Marilyn Little and Raylyn Farm were looking to import a talented young horse named Smoke on the Water and the Manders signed on as co-owners. The gorgeous grey Wurttemburg gelding was Marilyn’s high performance partner through the four-star level until his untimely death from a stable injury in 2014. That year, the Manders imported RF Scandalous and as owners, are helping to produce yet another top international horse for Marilyn and U.S. eventing.